Looking to go on Safari but unsure with whom to make that Safari Package Booking, See our latest Reviews and Discover the Beauty that surrounds Us. Heritage Tours & Safaris was established in 2003, the company's head office is situated in the heart of St Lucia, KwaZulu Natal South Africa's very first world heritage site (Unesco 1999). 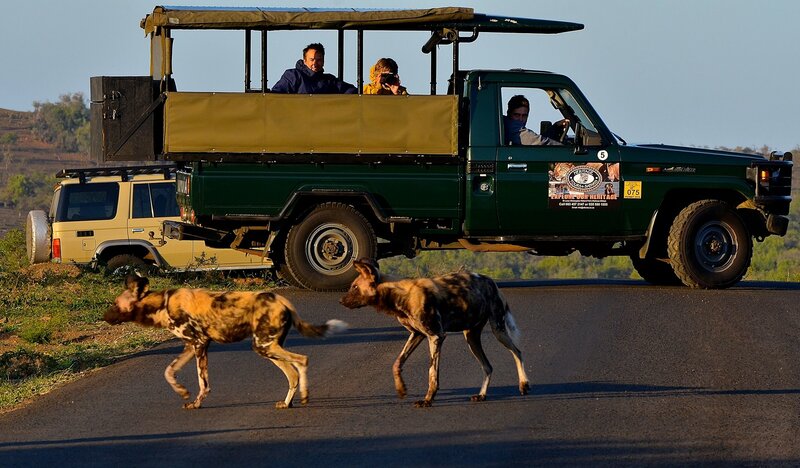 The company set out initially with the intention of only offering Day Tours & Day Safari Outings. However due to growth and popularity in offering high standards of service the company soon realized that Safari Packages to South Africa would offer clients so much more. Early 2006 the very first South African Safari Package was made available and the response was incredible. The very first Safari Package was a 3 Day Overnight Safari, which highlighted the local area of Hluhluwe-Imfolozi Park as well as iSimangaliso Wetland Park. Since those early days numerous new South African Safari Packages have been developed and to date ironically the initial 3 Day Overnight Safari Package remains one of the most popular. We would like to thank our clients for taking the time to reply to us with some incredible Reviews and More importantly letting us know just how much they enjoyed their time while out in the Bush. We had a fantastic stay. At Heritage House was lovely, So clean, quiet and very well placed for walking to the main street for a meal and drinks. Breakfast was brilliant. The Tours and Safaris we took were breath taking and our Guide David looked after us so well, He couldn't have been better. The only mistake we made was not to plan 3 or 4 days extra to explore on our own. The star of our stay how ever was Sylvester the House cat who normally keeps himself to himself. We will be back. We enjoyed an incredible Bush & Boat Package with our guide Dumi. He explained a lot about the animals and it was great to see his joy when we found the different animals! The breakfast was very nice, just imagine while in the bush! Dumi did everything so that we could see as many animals as possible later in the afternoon we did the 2 hour boat trip with Stacey. It was very informative and nice! Both guides had a good knowledge about animals, nature, the region, etc. It was just amazing and everything was very well organised! Thanks a lot to Dumi, Stacey and the whole Team for an unforgettable tour!! My friend and I were visiting from Sydney and booked the 4 night package prior to joining a cruise. This package was incredible value. We stayed @Heritage House B & B for 4 nights where Thea made us most welcome. Also all the staff there. Their breakfasts are to die for as is their accommodation, so centrally located to the town. The Safaris to Hluhluwe-Umfolozi and to Isimangaliso were wonderful ¡Amazing! Thank you so much to John and Sky (sorry if I have wrote incorrect the name Sky), they were great, actually they have been the best guides we have ever had in Africa. Always were thoughtful and patient, and they taught us a lot about birds and the other animals, insects included. It was very interesting as well to know something relating to what is happening now with the Rhinos, Elefants and others in Southafrica and in Africa in general. We went on a number of trips with Heritage tours. Nothing but awesome. The guides were so helpful and just did anything to make us feel welcome - as if we were part of the family. We will be going back with some friends in Feb - I’m sure it will be brilliant again. 1) St. Lucia guest house: simply great! Very nice and professional Staff; Rooms are very confortable, fully furnished and provided with a/c. Breakfast is served in the accomodation garden: outside breakfast hours there is a common area managed according to an “Honesty Pick Up List” to be paid separately with both food and drinks availabe on a 24/7 basis. Overall it is an excellent accomodation with better than expected rooms and excellent staff. 2) Safari (s.c. 2 nights package): it consists in 3 safaris during light hours and a night safari. Daily safari envisaged: boat trip to spot Ippo, full day safari in Hluhluwe Umfolozi Game Reserve and iSimangaliso Wetland Park natural reserves, night (after sunset) safari in iSimangaliso Wetland Park. The after sunset safari proved to be the better one, with higher number of spotted animals and a wider variety. During all the safaris the rangers proved to be very friendly, flexible and full of understanding of the guest expectations: Sky tryed his best to let us spot big fives and Kyle provided very insightful anectodes about for African Birds. We benchmarked with the guests using other travel agents and we had by far the best safari experience. Heritage provided us breakfast, food (home made) and beverage (including soft drinks) of a very good quality (taking into accout the overall outside conditions) and everything was tidy, environmental friendly and properly stored. 1) The staff of Heritage T&S Back Office proved to be really precise and efficient in solving our organization problems (thanks Bev for arranging the Shuttle from and to Durban) and no unexpected or unquoted expenses popped up (e.g. other places in SA asked us for undisclosed bank transactional costs or last minute fx rates adjustments). 2) The ranger that assisted us during the different safaris proved to be real professionist (they were all officially licensed), with real understanding of the natural environment and really motivated to provide a great experience. I booked a complete 4-night package with accommodation and transfer, which was quite easy and my contact Bev was very helpful and supportive. The tours included a Big-5 safari in Hluhluwe, a hippo and croc boat cruise, a day tour to Cape Vidal, a turtle tour, as well as a night drive in iSimangaliso. I cannot describe how amazing they all have been!! Not only seeing a diversity of animals but a fascinating landscape as well. All tour guides were incredible with all their info and stories, always trying to make us feel comfortable. I would always do it again and can highly recommend it. So we did the 2 night, 3 day tour, which consists of four trips - one estuary cruise, two safari drives (one at 5am and one at 8pm) and a final beach + bush experience. It was really easy to book online with the help of the lovely Bev. As for the safari, we loved every minute of it - and it didn’t hurt that we got lucky and saw some amazing animals! We saw lions, rhinos, hippos, elephants, crocodiles, zebras and giraffes to name but a few. But the best thing about Heritage are the staff! We had Stacey, David, Mandla and Paul - all of them were extremely knowledgable and passionate. They really enriched the experience and explained things to us that we would never have gathered if we’d done a self drive! The guides could not have done enough to make sure we had a great experience. The accommodation is lovely too - it’s just around the corner from the office at Heritage House. If you’re not sure about St Lucia or Hluhluwe - DO IT! It’s a really authentic experience - it’s not crowded, there aren’t masses of tourists like at Kruger. The reserve is public so guides can’t go off road, meaning that you’re seeing the animals naturally, and it makes it all the more exciting when you spot one. My husband and I went to South Africa in Dec 2017. I picked Heritage Tours just from internet searches of safaris, and I'm so happy that I did. We did the 7 night package. Everyone was amazing! Bev in reservations was great at communicating with me regarding the booking, payment and coordination of our schedule. We had Stacy Farrell for almost all of our excursions and safaris - she is amazing! Stacy knows more about the animals, plants, culture, land, history, people and South Africa in general than anyone else that I could have imagined. I learned a lot from her. She also went out of her way to make our trip special. She re-arranged our schedule to work the best for everyone, she helped us see and do everything we wanted. Heritage is lucky to have her! We also stayed at Heritage House for our accommodations, and was very pleased with them as well. The house was clean, big and welcoming. Thea was very friendly and a great host. The bed was comfortable and the breakfast was very good. I suggest that anyone going to South Africa should use Heritage Tours and stay in St Lucia - I promise you will not be disappointed! Thank you for making our trip one that we will always remember and cherish!! Numerous factors attribute to the fact that our safari packages are so popular. SEE OUR AMAZING PACKAGES NOW!